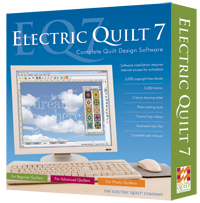 EQ7 – A must have! As promised, here is the first of the must haves – the new EQ6 upgrade from Electric Quilt Co. – EQ7! Shortly before going to Market, I had heard the upgrade was going to be available in June. As you must know by now, EQ6 has been my favorite tool ever since I started designing my own quilts. I had started with EQ5 and upgraded to EQ6 in 2007. That was a significant upgrade. The differences between EQ6 and EQ7 are not that dramatic, but if you are a serious EQ6 user the improvements are definitely worth the upgrade! At Market, I ran into an old friend from my Chicagoland days, Barb Vlack. Barb is an expert in all things EQ. She is a technical advisor, has written a few books for them, teaches, and does much more, I’m sure. Way back when in my Program Chairperson days for Pride of the Prairie Quilters, I had contracted Barb to do an evening program for us. That’s when I learned that even though I used EQ extensively, I hadn’t even scratched the surface! The ability to edit and manipulate photographs, almost as well as Photoshop Elements without having to leave the program. This includes the ability to manipulate scanned images of fabrics. This sounds very efficient to me. I hate toggling back and forth between the two programs. Plus it opens up a whole new world of easily creating images/fabric with photos as I have seen done by other designers with much more complicated software. A graph paper grid on the Custom Set Layout. I love designing on Custom Set Layout, but it can be a pain to have place blocks on an empty piece of paper and have to do math in your head to get everything in the right place. I think this was Barb’s idea! Thank you Barb! The ability to click and drag objects onto the layout. This will give EQ more of the same feel as most other drawing programs out there. I know there’s more, but these are the improvements that struck me. Check out www.ElectricQuilt.com for more information and to order yours today!!!! I was lucky enough to pick up my copy while in Minneapolis, but, alas, carrying my laptop from here to there evidently jostled something on my DVD/CD drive and I couldn’t load the upgrade disc. It was less expensive to order an external drive than to get the computer fixed – so here I wait! What a tease to have the CD in my possession and not be able to play! Hopefully, I’ll get to play real soon and upload some images of what I was able to create! 2 Responses to EQ7 – A must have! I’ve had problems on and off with the DVD/CD drive since I got the computer. I don’t know if it got jostled around just too much this time. Oh well – a $50 external drive is certainly better than if the whole computer got sick!